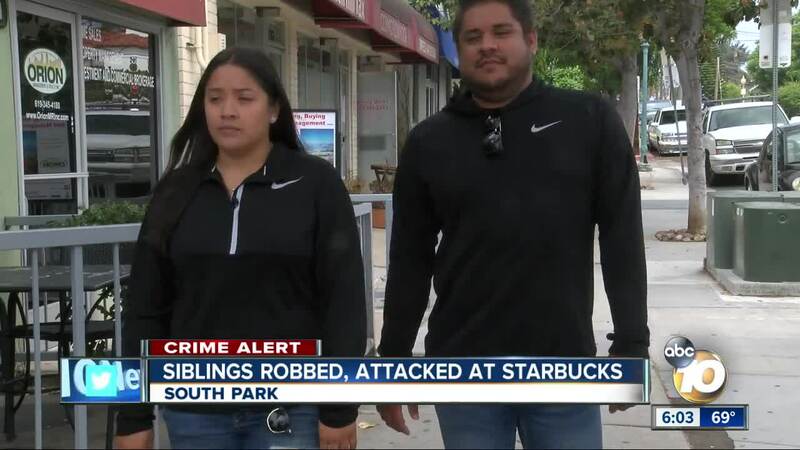 SAN DIEGO (KGTV) - A trip to a Starbucks in South Park turned violent after siblings were robbed and attacked on the patio. Chris posted an ad on OfferUp app Monday, hoping to sell his iPhone X for $725. By the next day, someone named Cameron had responded and agreed to the asking price. "He's the one who suggested Starbucks to meet up," said Chris. They agreed to meet at a Starbucks on 28th Street and just before 7 on Tuesday night, Chris and his sister Bianca arrived and sat in a packed patio. Not longer after, an African-American man in his early 20s, wearing a dark hoodie, walked up to them. "He walked up and said, 'Are you the one selling the iPhone?" We said yes, and he sat down," said Chris. It was then another man in a gray hoodie also appeared, asking about phone accessories. "The first male who said 'Okay, we'll take it,' grabbed it to go and I put my hands on it. When he went up, I kind of went with him ... and we got into a tussle," said Bianca. When the second man tried to join in, Chris made his move. "I yanked him back and that's when I got hit in the head. I blacked out," said Chris. "I heard him scream or make a noise and that made me turn around," said Bianca. Bianca says she saw a third man who had hit Chris, then take off along with the other two. She gave chase. Chris, who had gained consciousness, wasn't far behind. Bianca says saw them get into a silver car, possibly a Honda Accord, drive off. "Definitely feeling shock and feeling violated," said Chris. They're also feeling pain: A busted lip for Bianca and a bloody gash for Chris. Anyone with information on the case is asked to call Crime Stoppers at 888-580-8477.